If you could go anywhere in the world and see something truly amazing, where would you go? 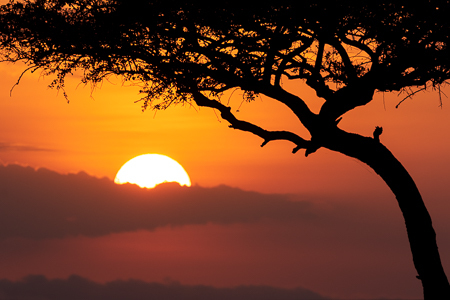 A lot of people have that very question buzzing around in their heads, and, an answer that often comes up, is Africa. 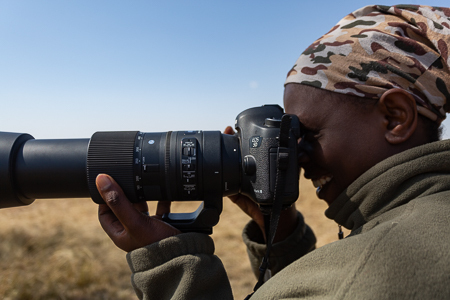 It seems like Africa is the last bastion of wild left in the world, or the lingering memory of every National Geographic show or cover you saw as a kid. 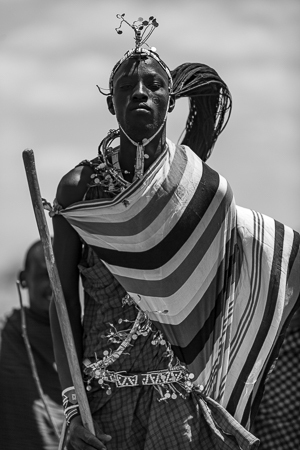 Whatever the draw, it exists, and nowhere in Africa is that draw greater, than in Kenya. 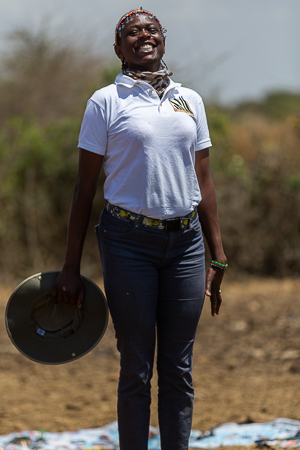 Kenya is perfect for so many reasons. One of which being the great migration of animals that happens in Kenya’s borders around August of every year. 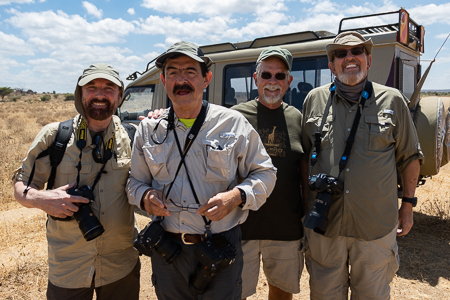 The perfect time for photo safari, and on this trip our very own Scott Donschikowski led this intrepid group on trip they won’t likely ever forget. Below is an account of their adventure. This trip had a little bit of an unconventional start. 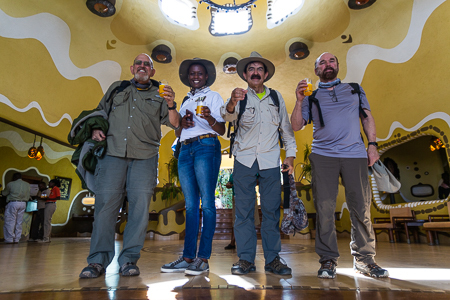 Since we were combining this Kenya trip with our Tanzania trip, so as half of our group members were relaxing in Arusha at the Lake Duluti Lodge, the other half were making their way to Nairobi for an overnight at the amazing Fairview Lodge. 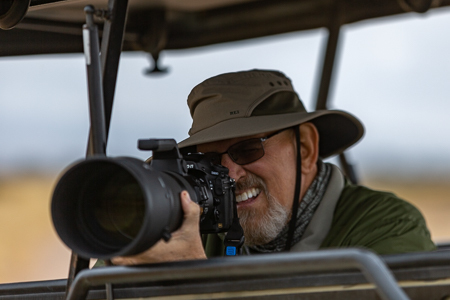 I was in Tanzania with one half of our group wrapping up that trip with some post-processing and image review before we retired for the night in our bungalows in Lake Duluti. 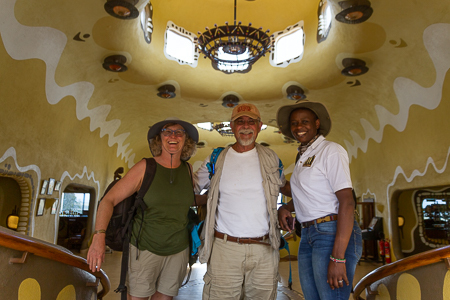 Our other group members were en route to Nairobi for a short stay at the Fairview Lodge before we all met up at the Kenya-Tanzania border in Namanga. In either country, there is always an opportunity to shop! 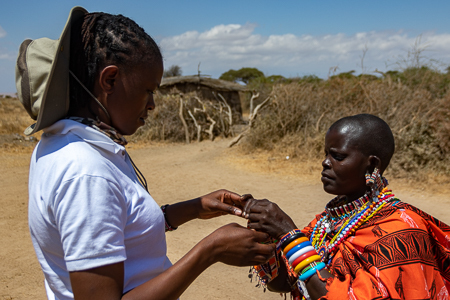 As we were processed at the border and finally in Kenya, we were greeted by a herd of local Masai women selling their wares. 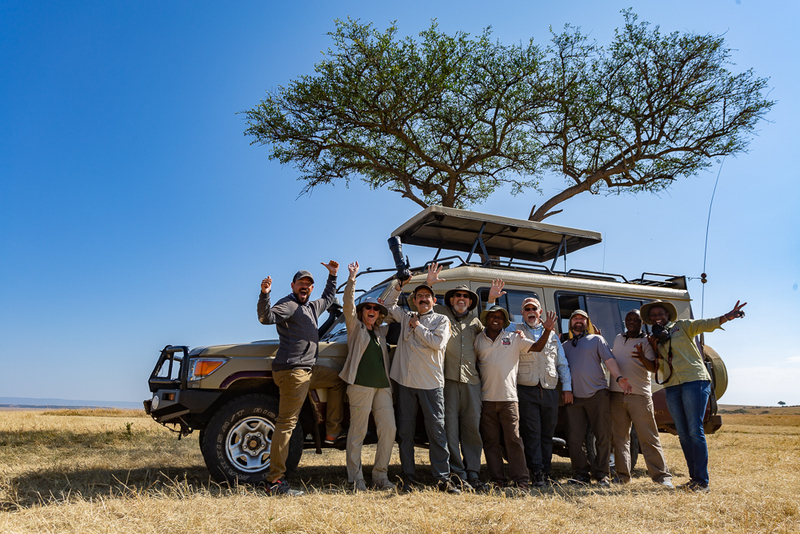 The second half of our group arrived and we consolidated vehicles, saying goodbye for a final time to our esteemed Tanzanian guide. 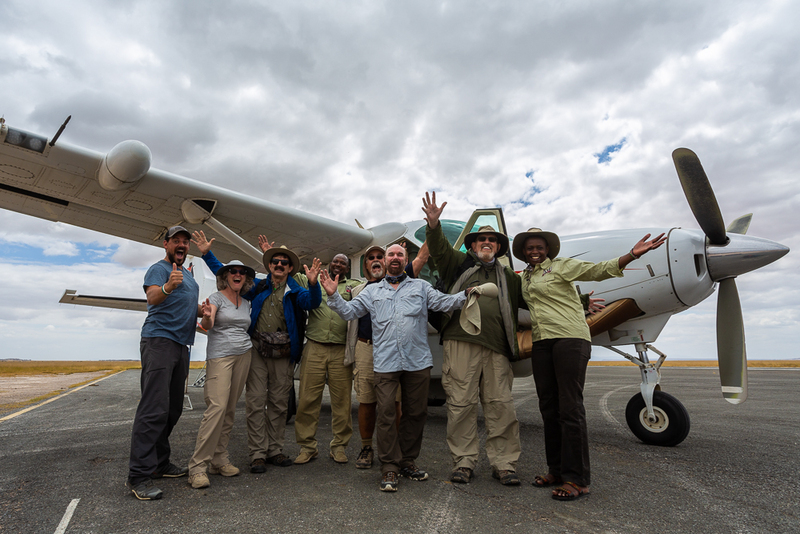 Now we were free to make our way to Amboseli National Park. 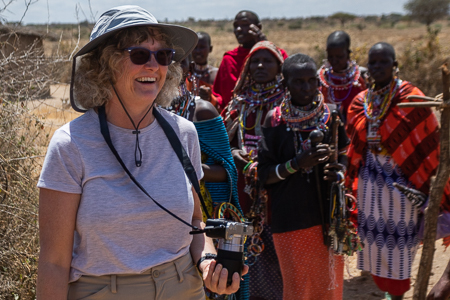 Along the way we stopped at a local Masai village and got the Kings tour of their bomas and culture. The village chief even personally blessed our journey! 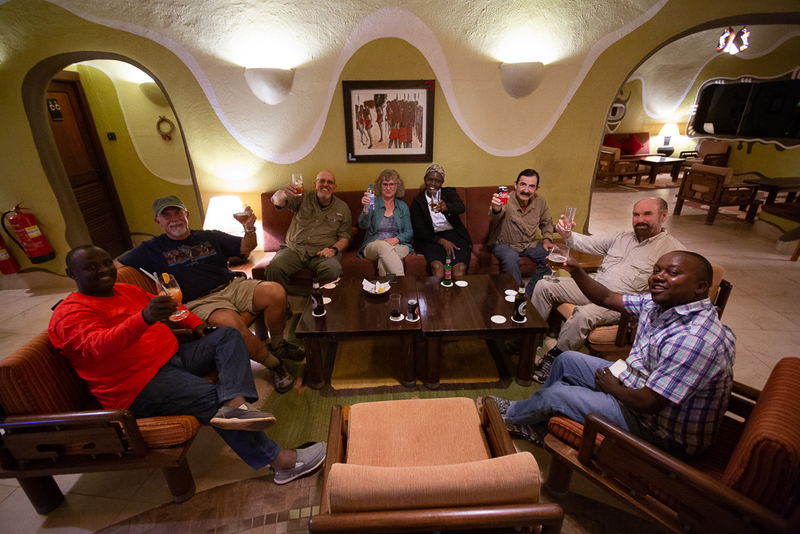 Once in Amboseli we checked in to our suites and then went out on our first game drive as a new group. It was amazing as always! 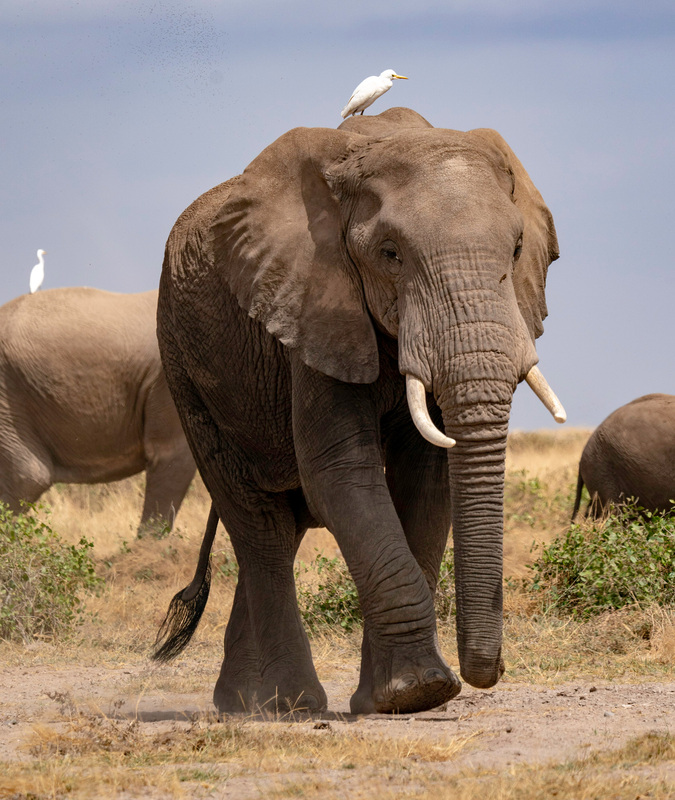 Amboseli is quite the place for elephants and on our first drive we saw a lot of them! 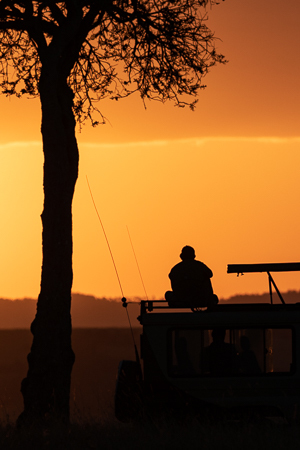 As the sunset proceeded, we photographed a large group crossing right in front of us with all the splendor and color that only a rare sunset can provide, although it seems here in Africa that these “rare” sunsets happen all the time! 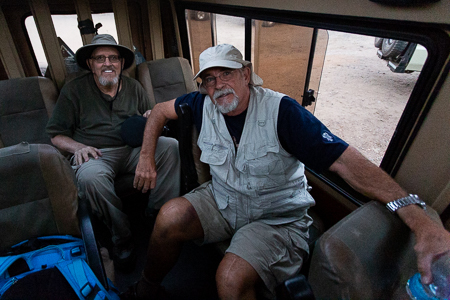 We woke up to a clearing morning sky, and as we hit the bush, the sun screamed across the savannah in the most beautiful golden side-light I’ve seen in a long time. 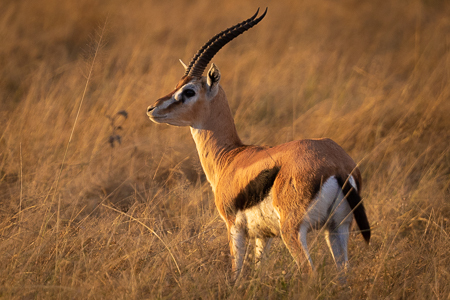 It's that kind of light that makes everything look amazing, and although we didn't find any of the big five, it didn't matter, even the gazelles looked awesome in this light. 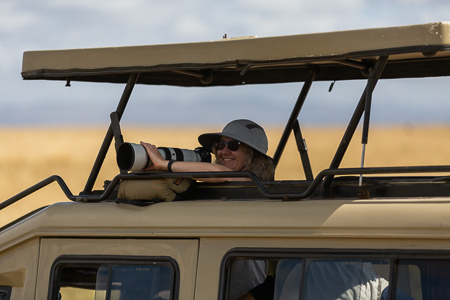 As we made our way around the park, we stopped to shoot a small lion pride, and then the sky cleared enough for Kilimanjaro to become visible, so we parked and waited for some elephants to cross in front of it and some classic shots that Amboseli is famous for! 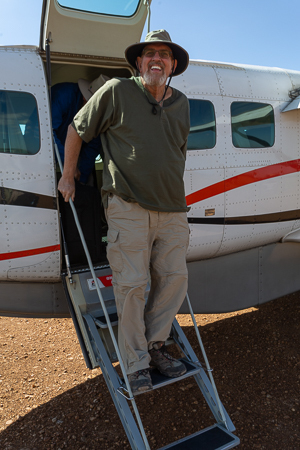 It’s definitely not a given that one will even see Kilimanjaro, so it was a nice treat. 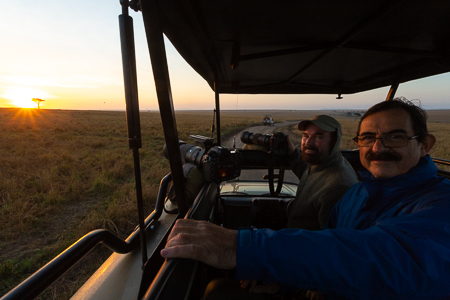 After lunch we spent some time hunting for some rare birds, shooting the elephants in the marsh, and then we spotted some lions so we waited for sunset and got some really nice shots of the elephants walking towards us with dust trails. Shooting into the sun normally isn’t a great idea, but the silhouettes of the elephants against the landscape with the dust was pretty amazing! 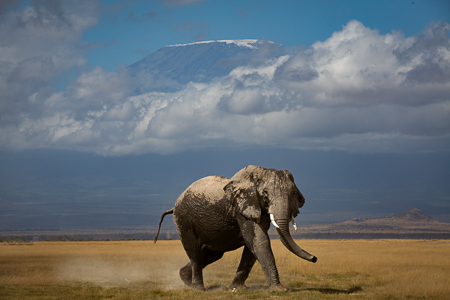 Amboseli in the Masai language means “dusty place,” and it was pretty evident this evening. 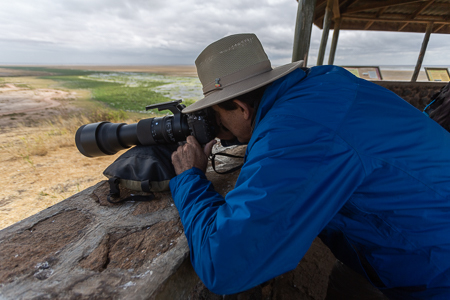 In the morning we drove over to a flooded area of the park to see if we could get a closer look at the flamingos. The light wasn’t fantastic but there were more than enough flamingos at the far end of our range to make some interesting shots. 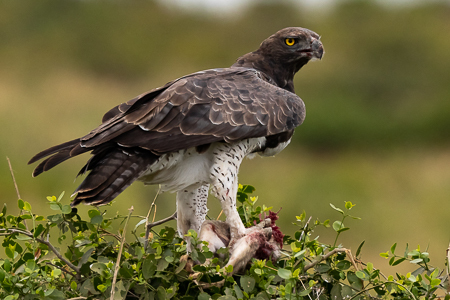 We were able to spot a martial eagle with a kill, and it let us get really close to grab some nice photos, which I thought was pretty rare, as they tend to fly away. After all the action we hiked up the observation hill to get a grand view of the surrounding area. 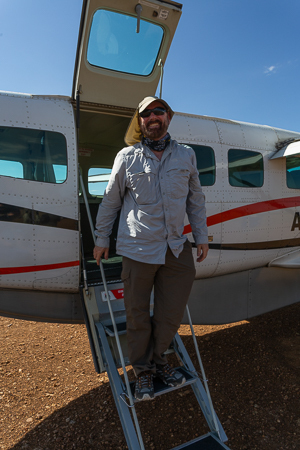 The weather was improving, but it was finally time for us to head across the country to the Masai Mara, so at the airstrip we had lunch and did a little post processing while we waited for our charter flight. 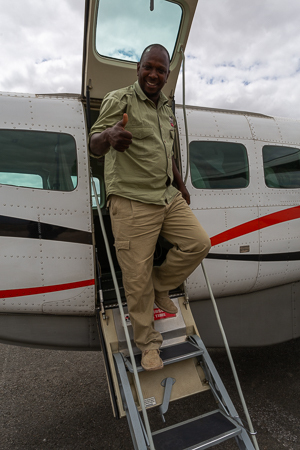 The flight went well, the weather was fantastic and allowed us to really see the landscape of Kenya as passed over the great rift valley. 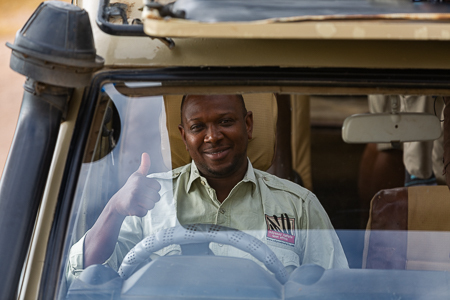 Once in the Masai Mara, we checked into our resort, and promptly headed out on a game drive where we hung out with a male and female lion as they courted each other. 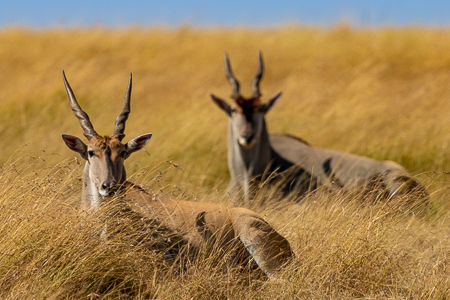 We were able to get some really amazing shots as this pair were absolutely calm with our presence. It took them awhile to get up and get active, but then one of the best lessons in wildlife photography is patience. The sunset this evening was phenomenal. The entire western sky was ablaze in gold, and it was a great way to end a truly special day! 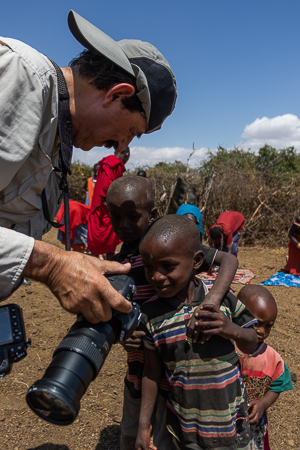 After the high of the previous days’ shooting in the Mara, our group was wondering how it could get any better. 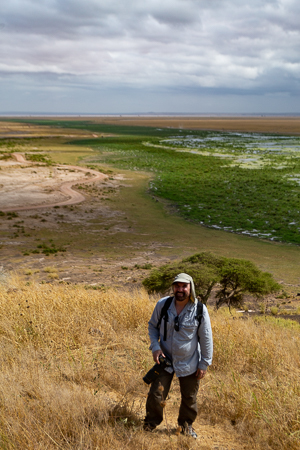 But Africa has a way of wowing even those of us who have seen a lot of its secrets. We had a crazy colorful sunrise, followed by a lot of action! 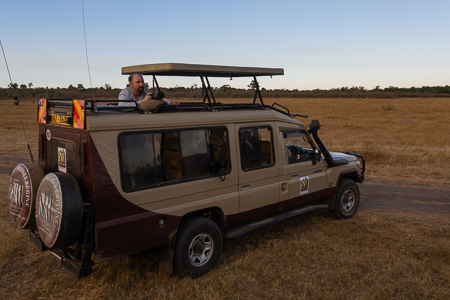 And it all started with spotting an otherwise uninteresting spotted hyena. 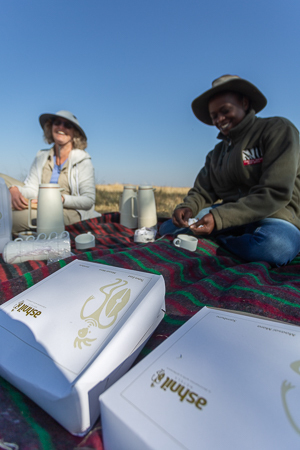 They canvas the savannah day and night, so they’re not entirely rare, but we spotted one who just happened to be part of a larger group who were stalking a wildebeest trapped in a watering hole. Now I won’t bother you with the details of what happened, but suffice it to say that it was exciting, unpleasant, and educational all at the same time. 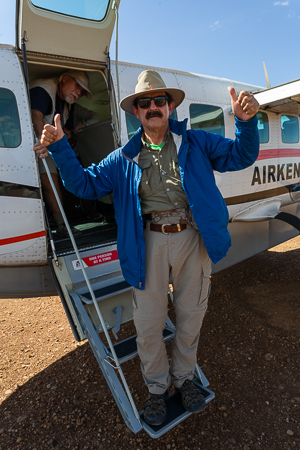 Our guides were chuffed at the experience also, because what we managed to see from start to finish is pretty rare. Oh and after that we hung out with a cheetah so you know, no big deal. After lunch we managed to find a group of about 2000 wildebeest that were preparing to cross a section of the Mara river. 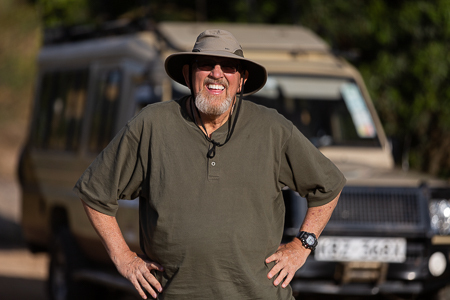 As we waited, the anticipation built, until suddenly, our engine roared and over 20 vehicles sprung into action crossing the field in front of us. 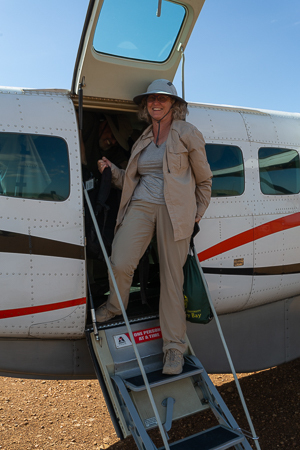 As we sped toward to the riverbank, we could see the massive line of wildebeest begin to cross the river with speed, and we careened over the bumpy ground at an equal pace, our hearts thumping. As we neared the dropoff, we stopped and stood, cameras clicking at with our mouths agape at the madness and chaos. A river-crossing. It was amazing. And even though (sadly) this would be our only viewing of one, it was nonetheless a spectacular sight to witness. And the rest of the day couldn’t compare to the action. 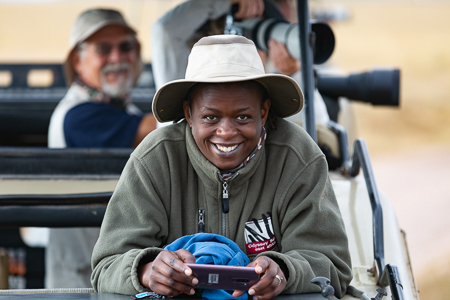 Every morning after a successful and productive game drive from the day before, I get butterflies in my stomach about providing an experience that would match what we had experienced. Even though I personally have no control of the animals or weather, the anxiety of doesn’t cease. But yet again we were greeted with a showstopping sunrise. As the balloons from the east took to the sky, we just had to stop to grab some photos of the horizon with the all the colors and layers and balloons; it was a postcard moment. 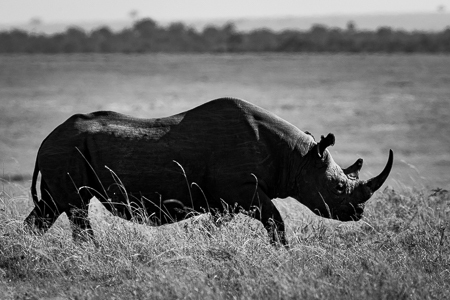 We later found a black rhino, unexpectedly, as they are a rather rare sight in the open plains, and we were able to grab some fantastic shots of it from multiple angles before stopping for breakfast. 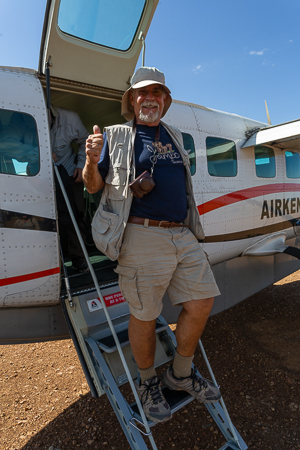 Finally we crossed the Mara river and made our way to our final stop in the Mara Triangle; Serena. 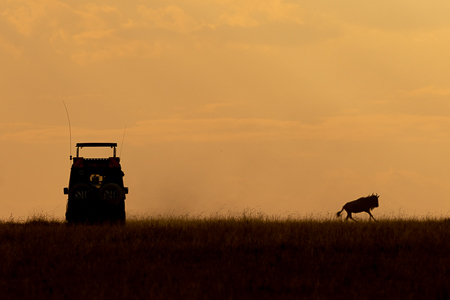 Perched atop a hill, the Mara Serena is the only hotel on the western side of the Mara river in the park. 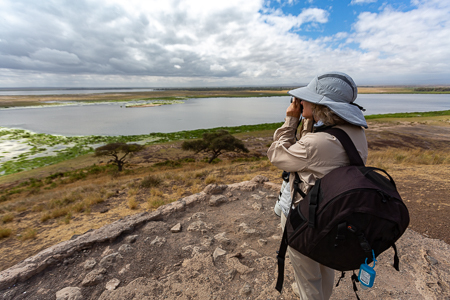 It is the best place for wildlife safaris this time of year, and its commanding view of the savannah is unmatched. 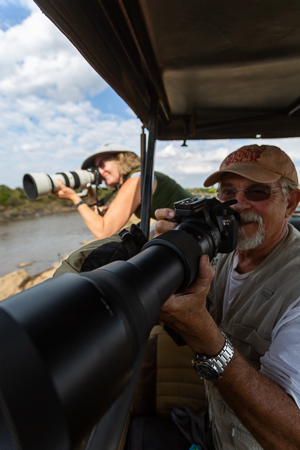 On our afternoon safari, we spent some time with lions, got really close to another herd of elephants and managed to get some intimate shots of the family with their young. And after that, well you know . . . amazing sunset! 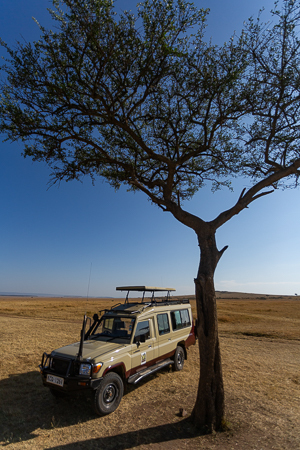 After another perfect sunrise against the backdrop of a picturesque balanite tree, we travelled around the park just looking for more interesting things to capture. 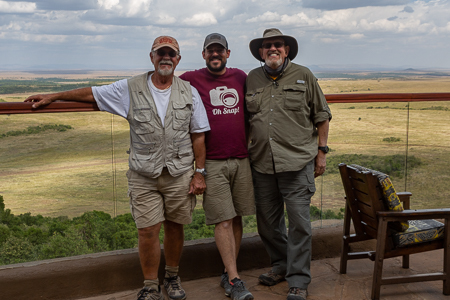 We were riding a high after seeing a lot of amazing things the past week, and even though we only managed to find one lion pride, (go figure) we got some respectable shots before stopping for breakfast. 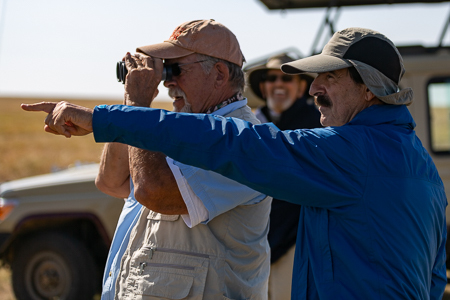 Suddenly though, a herd of grants gazelles got spooked, and half of their group became severed across the road we were driving with a few other vehicles. 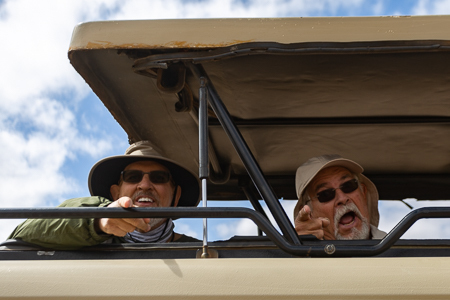 Because they get a little weary, even of safari vehicles, they thought it would be a good idea to sprint full-speed across the road and jump over it. So we had to stop and grab photos of the maybe 30 or so that put on this display for us! The afternoon was shaping up to be a little slower paced, as we drove around for the first half, looking for anything to catch our eyes. But just as we were beginning to get discouraged, we caught two lionesses hunting and catching a wildebeest, followed by spotting yet another small pride (maybe even from the same family unit) very close by and grabbed some gorgeous shot of the big male as he lumbered around his pride. It was crazy! And it all happened within fifteen minutes of one another. 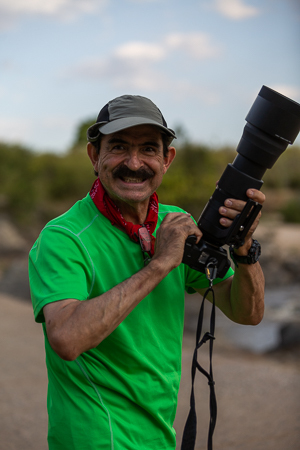 With ear-to-ear smiles on our faces we began the slow drive back to the hotel, when out of the corner of his eye, our guide saw something peculiar. 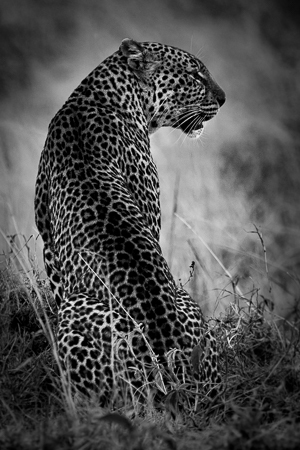 A leopard! And for the next 40 minutes we watched in awe as this mother loved on her cub, went for a quick but unsuccessful hunt, crossed the road, and returned to love on her again. WHAT? Mic drop! Needless to say, our guides and I were ecstatic and relieved to have seen something that not many people get the chance to see in the wild. There were many toasts at the bar that night. How do you top that? That’s what I kept thinking the whole morning as we went out for our last game drive in Africa. 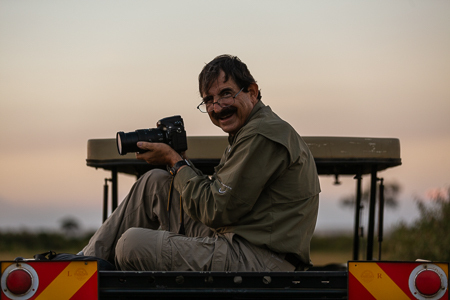 There was another spectacular sunrise that we stopped to shoot, we had another spectacular breakfast under a balanite tree and we all marvelled at the spectacular opportunity we had all been given; being able to witness some of the most amazing things on planet earth, things most people only get to see on television. We were quite content. The morning was a little slow by the standard that had been set so early on in our adventure. 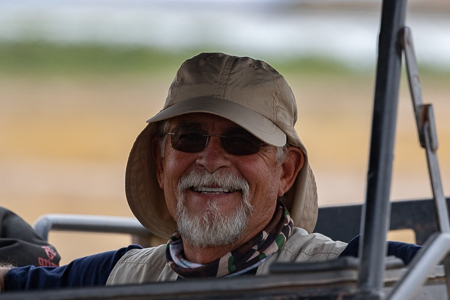 And we waited for a couple hours for a great herd of wildebeest to cross the Mara river. 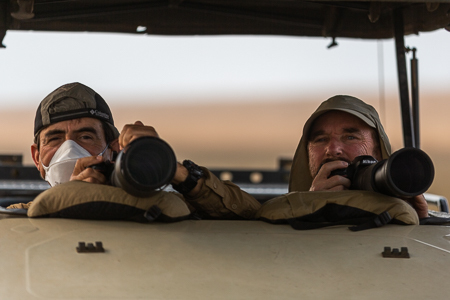 We even spotted a cheetah hunting, but then the call came for us to depart. 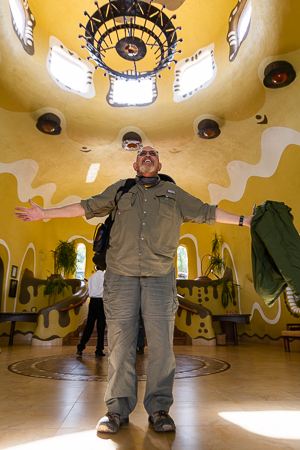 We reluctantly packed up our belongings, and after a short charter flight, we arrived in Nairobi and finally to our hotel, The Fairview Lodge. After some more shopping, and quick shower, we all reflected on the adventure by the pool, and reminisced about the past week, or many weeks for some of us! But there was one thing we had most in common. None of us wanted to leave. 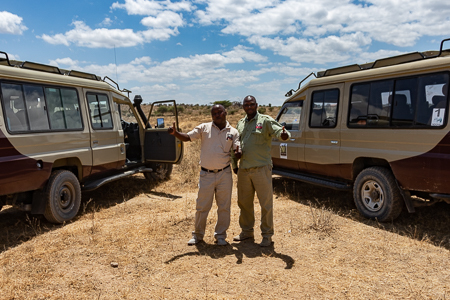 I kept expecting another car to pick us up and then take flight to another location to go on some other adventure with game drives and wild animals. 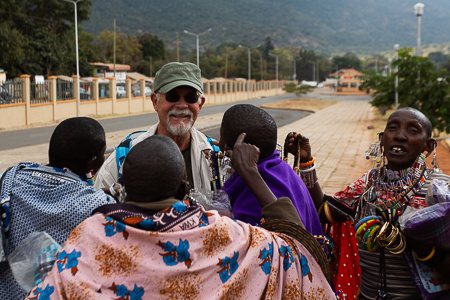 But I was also content with the fact that after a month in Africa, it was time to return home. As long as I live, these are the moments I’ll remember forever. The friends that I have met on this journey have experienced something unique together. And the pictures are just a way to remember the adventure with the hope that one day we’ll return and do it all over again. 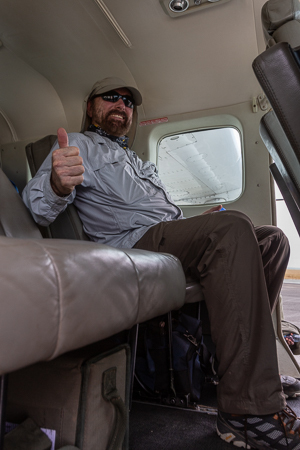 Until next time, Scott, Odyssey Safaris, and the rest of the Aperture Academy team.